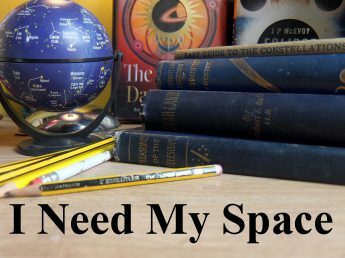 Observations 13th September 2018 | I Need my Space! Here’s an observation report I wrote for the Wolverhampton Astronomical Society’s on-line newsletter. 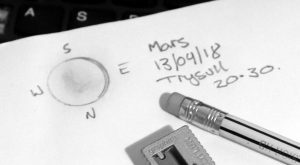 With Mars at its closest approach since 2003, and the prospect of a clear sky to view it, a last-minute observation session was hastily arranged for Thursday 13th September at our Trysull observation site. 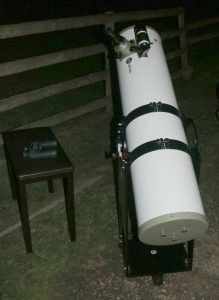 I took the society’s 12” dobsonian reflecting telescope (the Tom Collier Telescope), and several other members turned up, all hoping to get a fine display of planets. The Moon was a waxing crescent in the west as we arrived, lit around 20%. Once the scope was set up, we all enjoyed fine views of the shimmering lunar landscape. I was particularly interested in the small craters in Mare Crisium, which were very noticeable. Crater Picard is 21 miles across, and Pierce is only 12 miles across, we could see them quite clearly. They will soon be washed out with sunlight and not viewable for another month. Quite distinct tonight, on the edge of Mare Crisium, was the distinct dramatic rises of Cape Cape Lavinium and Cape Olivium. To the left of the Moon, lower, just heading towards the trees, we saw Jupiter. With the sky not yet dark, the cloud belts were faint, but three of the moons were visible. The brightest, Ganymede, to the telescopic left. Although we could see only three moons, checking later with the Jovian Moon chart in Astronomy Now, all four should have been visible. Dimmer Callisto must have been lost to the twilight sky. The next planet to appear in the twilight sky was Saturn, in the south-west, which, being higher than Jupiter, afforded us a much steadier viewing image, and it was stunning. Accompanied by its moon Titan towards bottom left in our eye-piece, the rings were easily viewable, as was shading on the rings and the shadow of the planet on the rings. I could see darker surface markings on the disc, which was very large in the field of view, thanks to the Tom Collier’s scope’s long focal length. I did have trouble focussing, which gave me some concern about the optics of the scope. Mars was our next planetary target, and several of us could discern dark markings towards the centre of the disc. Checking later on Stellarium, (the free Astronomy program), I found these markings were Sydris Major. The exact shape of these markings were hard to make out, and the atmosphere around 8-9pm was very turbulent as the Earth cooled down. But even so, it’s been many years since I’ve had chance to see surface features on Mars. I’ve been watching it through the summer, and dust storms have prevented us from seeing any surface markings earlier in the year. Also visible was the Martian moon, Phobos. I turned the Tom Collier scope to the double star Altair, to see if I could split it. Unfortunately, the optics showed a very distorted image. We put this down to poor collimation. At a previous Trysull session with the Tom Collier last year, we were rewarded with some spectacular stellar views through this scope, so we vowed to collimate it again at the next Monday Highfields meeting. Luckily, David Wilson had bought along his Orion Optics 10” reflector on a Dobsonian mount (Picture 1). Being a stickler for correctly collimated optics, David’s scope performed admirably, and certainly saved the day, as it was obvious the Tom Collier wasn’t up to any serious deep sky observing this evening. With Saturn in Sagittarius, it gave us an excellent reference point to explore this constellation, which never rises high in this country, and is only visible during Summer months. We looked at the Lagoon Nebula (M8) and in the same field of view, Hershel 36 (The Hourglass Cluster), or NGC 6530. The nebulosity was faint, and required averted vision to see it, but the cluster, in the same field of view, looked lovely. With the first Messier object under our belt, we then looked at the globular star cluster M22, again in Sagittarius. With averted vision, we could see the many stars that make up this bright cluster. Just to make a comparison, we turned the scope towards the great globular cluster of M13, overhead in Hercules. Although M13 was brighter, we found we could see more individual stars in M22. I suppose this is to be expected, as M22 is a lot closer to us than M13, according to my Cambridge Deep Sky book. Using my 10×50 Opticrom binoculars, I found Sagittarius a splendid binocular target, with many deep sky object visible, especially the two ‘star clouds’. There are more Messier objects in Sagittarius than any other constellation, and it’s not surprising, seeing as we’re looking towards the galactic center. As the sky darkened, we looked at the double cluster in Perseus, NGC 869 and NGC 884, which was most pleasing, and the sky appeared inky black behind the clusters. The 10” mirror was giving us exceptional contrast. I think the Double Cluster can be a bit underwhelming in smaller scopes, but the light-gathering capacity of the 10” mirror meant we could enjoy the cluster to its fullest. With Cygnus overhead, the double star Alberio was an obvious target. We enjoyed a very crisp view of the large gold star contrasting with the dimmer, blue companion. The final deep sky object of the evening was probably my favourite – the Wild Duck open cluster in Scutum (M11). This was found by ‘star hopping’ from Altair in Aquila, (it should be noted that all objects we found tonight were located using ‘old school’ methods of maps, memory and star-hopping). M11 has to be one of the finest open clusters in the Northern Hemisphere, it’s so dense and compact, with a distinct shape that is easily recognisable and unique. The Trysull observing site is best suited to Mondays and Tuesdays. Tonight, being a Thursday, there was a meeting in the adjoining village hall, and just after nine pm the curtains were flung back and light flooded the site, causing us to grudgingly pack up our instruments. Later, as we sat in the pub down the road, and I wrote in my observation book (Pictue 2), I noted that we really only had just over an hour’s worth of real observing time, with the air turbulent for much of that time. But despite this, we managed to get fine telescopic views of the Moon’s craters and mountains, three planets, five planetary moons, two globular clusters, four open clusters, two galaxies, a diffuse nebulae and some double stars. This is why it’s always worth making the effort to attend the observing sessions whenever possible, even if you don’t have a telescope or much time to spare. As long as the clouds part, there’s always something cosmic to see! If you’re interested in attending an observation session, please give a committee member your mobile number and you’ll be put on the text notification list, and will be informed of every upcoming session.